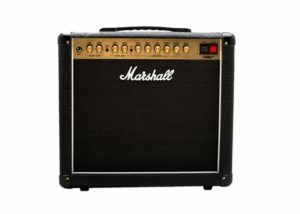 Once you get the fundamentals of playing rhythm guitar down, you can then look into what it takes to play lead guitar. Rock Guitar 101 shows you this in lesson 6. Lead guitar is more about melody and this is created by learning how to play guitar scales. Scales are the foundation for playing guitar solos. Lead playing is a bit more advanced than playing rhythm. In my experience, it requires more string-time, more commitment and much attention to detail. The dedication and patience needed to be a good lead guitar player are greater because a guitar solo in a song only comes through once and does not repeat as rhythm does. A chord progression that produces the rhythm of the song repeats over and over to provide the foundation for the melody to stand on, as where the guitar solo is just a small piece of music within itself to enhance the rhythm. This is why it requires more work but also gets more attention as well. Now when it comes to guitar scales for playing guitar solos, there are literally thousands to choose from. I know, crazy huh? But for our purposes today just getting started we only need to know one. The most common and that is the minor pentatonic scale. 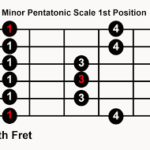 The most common scale that is used by all the great rock guitar players is the minor pentatonic scale. The reason for this is because the notes fit together in such a way that they work over many chord progression that makes up the rhythm of all rock and blues songs. Once you get this scale (fretboard pattern) down and be able to visualize it on the fretboard, it will come very clear to you how they use it to create those jaw-dropping solos. And when this happens a light bulb will go on above your head and you’ll see how you can use it too. Minor pentatonic scale in the first position. This means that it is being played at the first fret. Now what we want to do is get real familiar with this scale or box pattern as it is sometimes called. In fact, I’d recommend you think patterns as it will make the guitar easier to learn and understand. Study this diagram. Know it, see it on your fretboard and get to where you can execute it on any fret. The 8th fret, the 12th fret, the 5th fret, etc. Here we have the same scale pattern presented at the fifth fret in A. We call it A because the note on the sixth string at the fifth fret (the note we start the scale with) is an A note. What is great about this pattern is that it stays the same no matter where you play it. The notes change, but the scale stays the same. This is a great place to start for creating guitar solos. So run through it from time to time as you’re learning your rhythm techniques. Once you can play this pattern up and down across the fretboard with ease, you will then want to learn your personality licks. What are personality licks? These are little guitar phrases that give the scale personality. And this is when it really begins to get fun and interesting. When you play the scale by itself, it sounds good. But when you add the personality licks such as hammer-ons, pull-offs, bends, slides, trills and so forth you get the scale to sound like music. And that is what you are after. In addition to learning this scale, you also want to develop your dexterity and motor skills through finger exercises. These will help you to get your hands in shape for future study on this subject. Since this is a beginner book we will stop here as far as lead guitar goes. 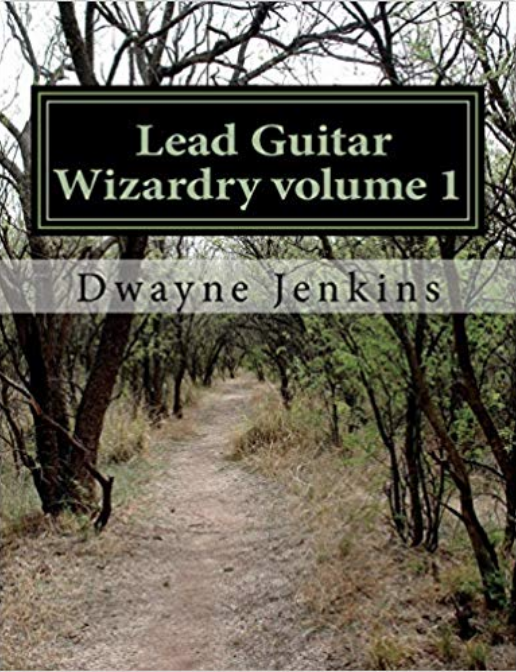 But if you want to learn more about what’s necessary for playing lead guitar and creating lead guitar solos, I recommend you look into my book Lead Guitar Wizardry Volume 1 that gets the beginner started on the path to lead guitar playing. 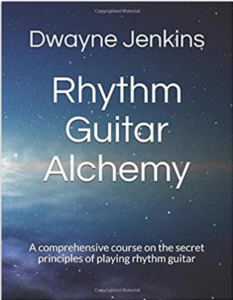 It teaches the fundamental principles and secret techniques needed to play jaw-dropping guitar solos. It will allow you to build a solid foundation of understanding in theory and practice. 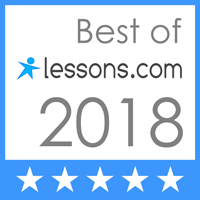 You will learn finger exercises, picking techniques, scale patterns, and fretboard knowledge. 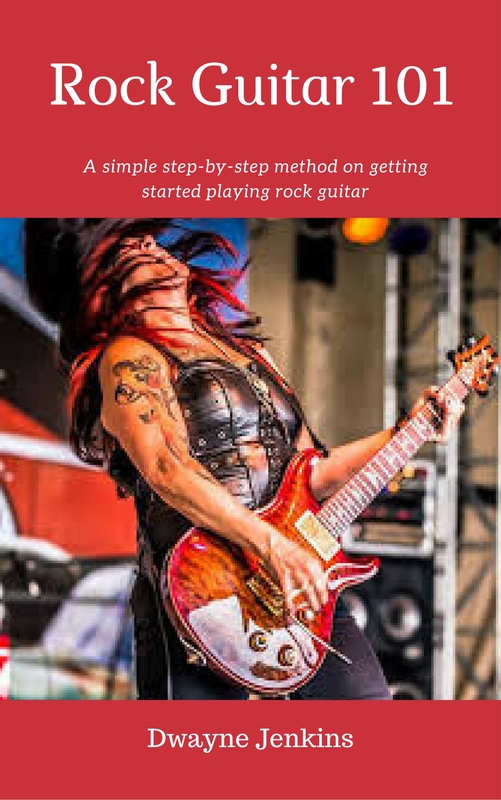 Among many many other things to help you develop the mindset and skillset to become a great lead guitar player. And if you take it one step further and really study and put in practice time, you’ll become a lead guitar wizard! Lead guitar playing takes work. There is absolutely no doubt about it. Playing rhythm does as well but I think lead playing is a bit more. 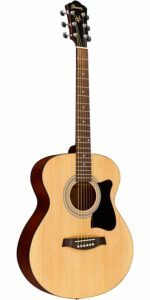 Especially if you would like to play some of the guitar solos that your favorite players who inspire you to play have written. Which I highly recommend you do. But this my friend, takes dedication and commitment to the most serious. But for now, just learn the minor pentatonic scale. For this is a great place to get started and I guarantee you that it will serve you well for years to come. And once you get it down clearly in your mind and you watch some of your favorite players on video or in concert, you’ll see them using it and how. Thanks for reading and if you need any help in anything that you’re working on, feel free to reach out. here or on social media. Also be sure to join my guitar club.